I agree, great skin! Thanks for creating it and sharing it!! Haven't been here in a long long time but I dig this. Control panel does not use your background color. I hope Im not over reaching, but is there any chance you could make a "light" substyle to go with this skin?? I love this skin, but it makes Microsoft 365 un-usable. Even the colors on my printer are messed up when I print anything while using this skin. I know theres a way to "edit" skins, but I have had no luck in the past, and I end up makng a mess of everything, ruining your guys hard work. Just thought it maybe worth my while to ask. Cheers and keep up the awesome work. Downloaded and installed/applied skin, however, it doesn't look any thing like the preview. I don't see any of the 'darkness' in the installed skin that is displayed in the skin preview. Are there settings that need manual change once skin is installed? Thank you for such a wonderful skin. It's my new default skin. I was using another by another very popular skinner, but he had the expanded and contracted arrows backward which was driving me nuts (a short drive, I'll admit). Again, thank you! Looks very good, keep up the good work! Impressive. Very nice. 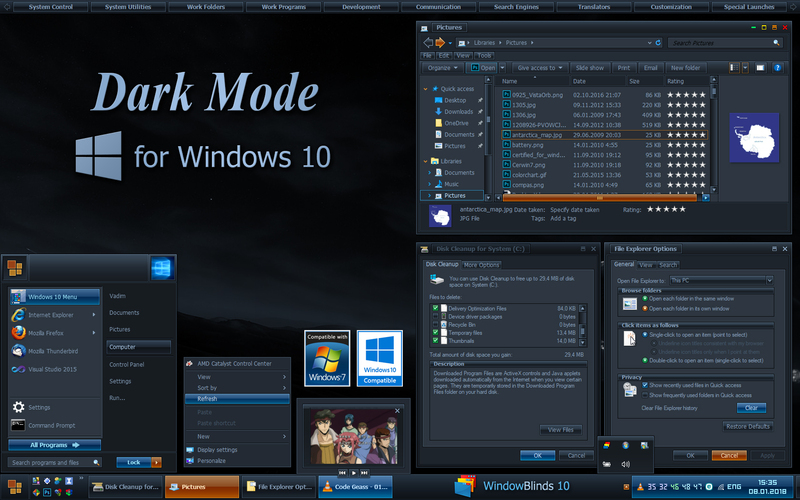 Running on windows 7. Excellent theme, easy on the eye. Works on Excel sheets. However, it affects the print color of MS Access Reports. Per Application Exclusion does not work. If you are not using Access then this is the closest dark theme to perfection. Curiously he asked... I've installed the skin and it looks great. However, it is not affecting everything in file explorer. The ribbon is still stock white and the section where all the files are also white. Is there a setting that I am missing or something along those line where i can change these? BTW - it's been 15 years since I've installed WindowBlinds. I thought you guys were purchased by Microsoft. lol. *edit - whoa... nevermind. It's now working. lol. Having a somewhat frustrating issue here. First off, let me say this theme is fantastic, and I love it! However, for some reason, my File Explorer window backgrounds are being forced to some variant of white when I apply the theme, and nothing I do to change it has any effect. Everything else, as far as I've been able to tell, looks exactly as expected. I'm using Windows 7 and WB 10. Please let me know if there is any more info you need in order to look into this. Hey, Vad_M! Having a somewhat frustrating issue here. First off, let me say this theme is fantastic, and I love it! However, for some reason, my File Explorer window backgrounds are being forced to some variant of white when I apply the theme, and nothing I do to change it has any effect. Everything else, as far as I've been able to tell, looks exactly as expected. I'm using Windows 7 and WB 10. Please let me know if there is any more info you need in order to look into this. Thanks!